This article was first posted on July 1, 2002, updated on May 1, 2014. Looking back over the past nineteen years, I thought it might be interesting to see how some popular investment strategies have fared since I quit work in November 1994. During that time, we've seen a five year bull market, a three year bear market, and another bull market where the S&P500 and Dow reached new all-time highs in October 2007. In the past six years we've seen another 50% plunge in stock values followed by a significant recovery with the Dow continuing to hit all-time highs in since early 2013. The NASDAQ continues to lag at a about 85% of its year 2000 peak. The good news is that anyone with a reasonably diversified portfolio did just fine. It's not bad news, but, of course, some strategies performed better than others. The chart below shows the results for a $100,000 starting balance and a 4% of assets initial withdrawal indexed annually for inflation. Vanguard index funds are used whenever possible in this analysis. If you want to check the calculations, you can download the Excel spreadsheet, click here. Only the 100% Fixed Income portfolio showed a loss for 2013. It lost 4.5% of its value as interest rates remained low while the inflation-adjusted retirement withdrawal continued to grow. The other seven all showed gains of 6% to 25% for 2013. Over the nineteen-year period the three Concentrated Portfolios have kept their lead with Harry Dent, Warren Buffett, and Harry Browne posting one, two, three. 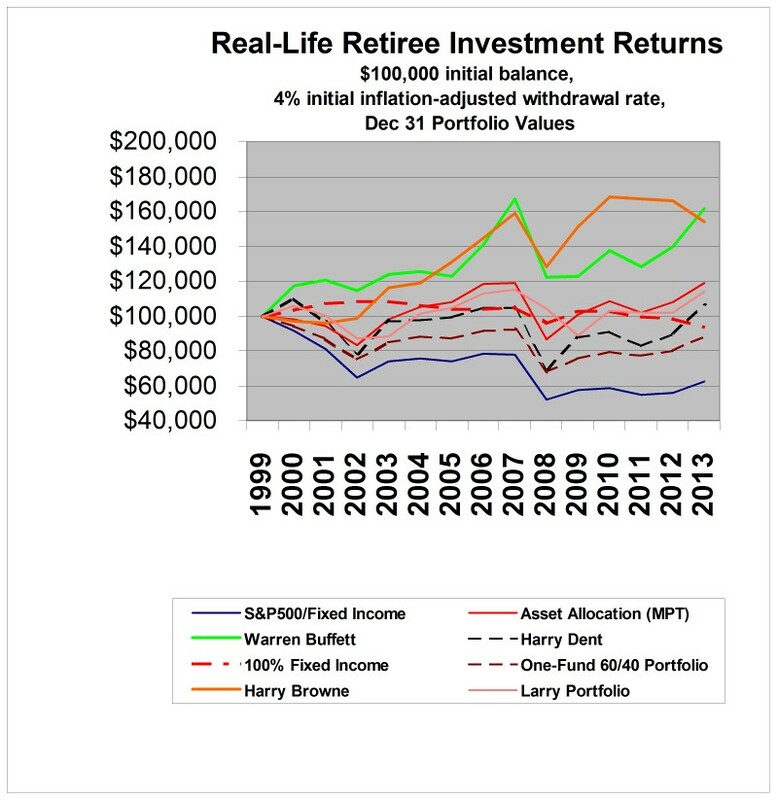 The three broadly diversified portfolios (Retire Early, One-Fund, and MPT) and the Larry Portfolio are grouped in the middle, while the 100% fixed income portfolio is in last place, lagging badly over the nineteen-year period. The inflation rate as measured by the CPI-U was 1.57% in 2013, almost identicle to the 1.59% figure in 2012. If we adjust the table and plot above for inflation and show the results in constant dollars, the December 31, 2013 portfolio values are reduced by about one-third. 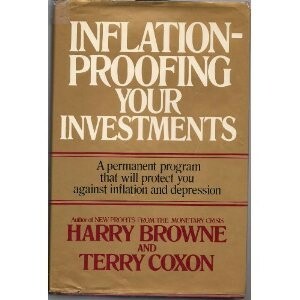 While Harry Browne, Harry Dent and Warren Buffett more than doubled in inflation-adjusted terms, the other four equity-based portfolios only showed a 54% to 90% gain. The 100% fixed income portfolio lost more than one-quarter of its value in constant dollar terms over the past nineteen years. 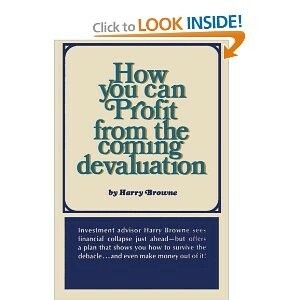 Retirees following this approach over the past nineteen years have been generally pleased with the results. Even after taking nineteen years of inflation-adjusted withdrawals of over $100,000, the account balance has grown to $296,116 as of Dec 31, 2013. The 25% fixed income allocation has also grown from 6.25 years' worth of annual withdrawals to 9.97. The Jan 2013 withdrawal of $6,129 amounted to just 2.51% of assets. Retirees following this approach over the past nineteen years have been generally pleased with the results. Even after taking eighteen years of inflation-adjusted withdrawals, the account balance has grown to $285,052 as of Dec 31, 2013. The 40% fixed income allocation has also grown from 10.00 years' worth of annual withdrawals to 16.18. The Jan 2013 withdrawal of $6,129 amounted to just 2.47% of assets. Some retirees just can't stomach the ups and downs of the stock market and prefer to keep all their retirement assets in fixed income securities. Few experts advise this, but folks do it anyway. Over the past nineteen years the 100% fixed income portfolio has steadily lost purchasing power to inflation and remains in last place overall. The January 2013 withdrawal amounted to 5.41% of assets. An allocation of 4% to Vanguard's Prime Reserve Money Market Fund (VMMXX) and 96% to Vanguard's Short-Term Corporate Bond Fund (VFSTX) was used for this all fixed income approach. While the MPT portfolio value has trailed the simple S&P500/fixed income portfolio (No. 1 above) by 18% as of Dec 31, 2013, advocates of this approach like its reduced volatility and sterling academic recommendations. Which brings us to an important investing truism -- it's OK to under perform as long as you're pleased with the results and proud of what you are doing. Warren Buffett ranked number 4 on the list of world's richest people in 2013, though he's hardly hurting with $53.4 billion of his wealth intact. It's even more noteable that he's one of the few members of the Forbes 400 who got there by investing in stocks rather than founding a successful business or inheriting his fortune. His investment strategy is to buy and hold positions in a few companies and watch them very carefully. Just four stocks (Coca-Cola, IBM, American Express and Wells Fargo) make up more than half the value of Berkshire's $118 billion stock portfolio. For the purposes of a retirement portfolio, a mix of 75% Berkshire Hathaway stock, 4% money market fund and 21% short-term corporate bond fund was chosen for the example below. 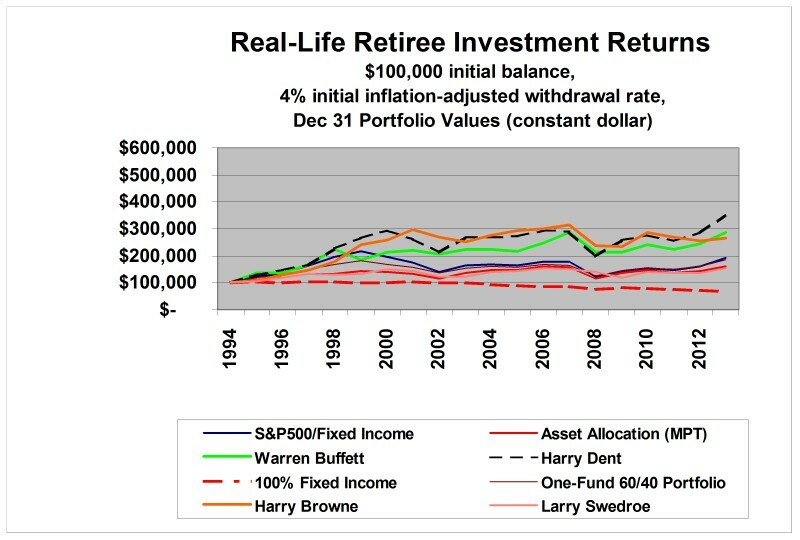 Through December 31, 2013, the value of the Warren Buffet portfolio exceeded the S&P500/fixed income portfolio by 50%. .
Harry Browne is an investment advisor who was the Libertarian candidate for President in 1996 and 2000. His Permanent Portfolio is equally allocated to four asset classes (Cash, Long-Term Treasury Bonds, Precious Metals, and U.S. Stocks) and rebalanced anually. 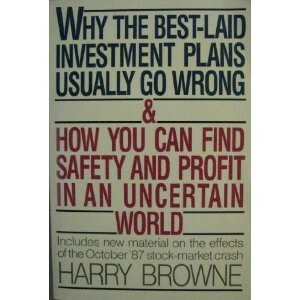 His investment philosophy is outlined in his 1999 book Fail Safe Investing. The Permanent Portfolio's outsized bets on Long-Term Treasury Bonds and Gold (Precious Metals) had made it a big winner in 2010 and 2011. 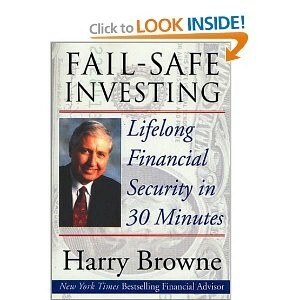 However, the big drop in the price of gold during 2012 made the Harry Browne portfolio a loser this year. Look for a rise in interest rates to inflect similar damage on its big allocation to Long-Term Treasuries. Larry Swedroe's mix of 30% small-cap value and 70% one-year US Treasuries seeks to provide a return close to that of the S&P500 with less volatility. Historically small cap stocks have beat the return of the S&P500 by about 4% per annum, so you can get the same "bang" with a smaller stock allocation. The Larry Portfolio has matched up well with the other 3 broadly diversified portfolios over the past 19 years. There's no shortage of losing strategies you could have employed over the past eighteen years. Market timing, day trading, Internet stocks with no record of earnings, etc. likely would have lost you money unless you were one of the fortunate few who sold out at the top. Retirees who see the value in holding at least 5 years' worth of expenses in cash and CDs and maintain some level of diversification in their portfolios would have rejected most of these losing investment approaches on principle alone. If you happened to retire in January 2000, the last twelve years haven't been pleasant. 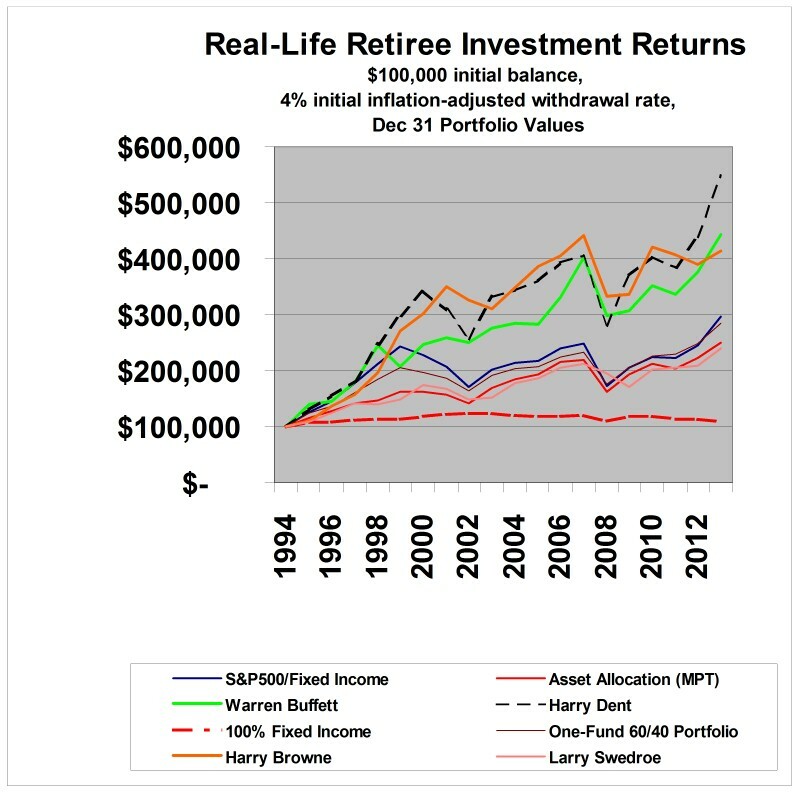 Only the Warren Buffett portfolio and Harry Browne Portfolio has a value appreciably exceeding its $100,000 starting balance. The 100% fixed income portfolio is underwater while the MPT portfolio and Larry Swedroe Portfolio are treading it. The other three portfolios all show losses. The worst performer was the 75% S&P500/25% fixed income portfolio which is now less than two-thirds of its starting value . The chart below illustrates this performance. What to conclude from these results? There's a reason Warren Buffett is regarded as the most successful stock market investor of all time -- and Harry Browne's big bet on gold and Long-Term Treasuries has worked out well, too -- so far. But even someone with a fairly pedestrian 60% S&P500/40% fixed income portfolio, who retired in 2000 at the market top, still has almost 90% of his starting value after 13 years of inflation-adjusted withdrawals, the bursting of the stock market and housing bubbles, and the economic collapse in the waning days of the Bush Admininstration. Pretty amazing. Copyright � 1996-2014 John P. Greaney, All rights reserved.